Box Polish polishes are made by hand and each bottle is presented beautifully and inside holds the most gorgeous nail polish. You an also request a specific shade, add glitter and personalise everything down to the bottle! This whole concept really drew me in and I wanted to find out more! Very Ciaté like these bottles are very sleek and a really nice size, where you can see what's inside the bottle. Having bottles these sizes are helpful with glitter polishes because you can really see what kind of glitter it is going to be. I love the black lid as it makes it looks very professional. 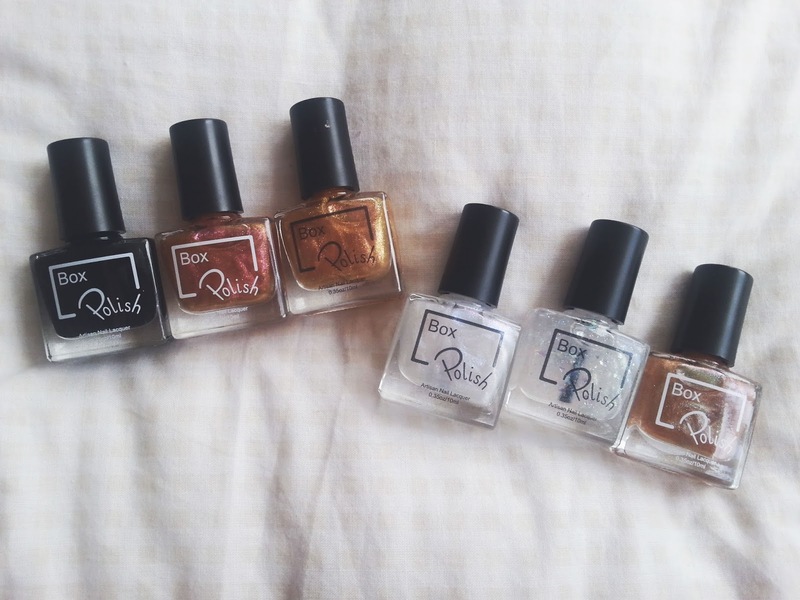 All the bottles have the Box Polish logo on the front and then on the back is the names of each polish and they are adorable names and fit really well with each colour. As soon as I opened the box, the first thing I did was swatch them, because I wanted to see what they were like. There was one opaque colour and the rest were glitters, I would say that all the glitters on their own don't show up very clearly on my little wheel; but on top of the black and other colours they would look amazing! The black took 2 even/thin coats and then it was done and like I said the glitters take more on their own as they do with any brand. The first two glitters and last one are all gold and vary in the size of the glitter so you can pick whichever you prefer. Then the sliver ones left are one small pieces and then a mix of chunky and fine glitter - one that has become my favourite all ready. Box Polish Officially Launches on the 6th September, 2-4 at the Pavilion, Cheltenham. Tea, coffee and cakes will be provided plus two brand new Box Polish collections, a competition to win a free polish and a live demonstration of the multi-chrome magic!